Common and mild Doxycycline side effects may include rash, diarrhea and nausea. More serious side effects of the antibiotic include loss of appetite, jaundice, severe stomach pain and mental confusion. These side effects are easily relieved and treatable, but they should be reported to a physician if they persist or become increasingly bothersome. Atridox side effects differ slightly and its use often results in some pain and redness at the injection site, but the occurrence of stomach-related side effects is reduced due to its administration method. Some doxycycline users have also reported headache and drowsiness, but these are very mild and clinical studies have yet to show if these effects are related to doxycycline medications. Patients experiencing these side effects should immediately stop taking doxycycline or doxycycline based medications and consult with their physicians or caregivers as soon as possible. Elderly patients experience the same rates of incidence of Doxycycline side effects as other age groups. Older age groups are often more prone to pre-existing medical conditions that can exacerbate doxycycline side effects, so older patients should be very closely monitored for stomach problems and decreases in urine production in particular. When the occurrence of side effects outweighs the benefits provided by these medications, patients and physicians are encouraged to work together in order to find a more beneficial treatment plan. Other classes of antibiotics are available that may be less problematic for elderly patients than doxycycline-based medications. 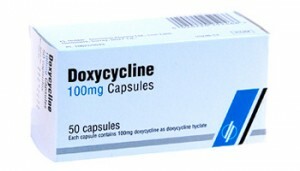 Doxycycline are all very useful tetracycline antibiotics containing doxycycline that serve a wide range of purposes, but should be avoided in those who have had a history of allergies or who are pregnant. People using these medications should fully understand the doxycycline side effects and what to do if they present themselves.